Azerbaijan is a country of contrasts in many different ways. It’s situated in the crossroads of east and west, being part of western Asia but also can be counted as a part of eastern Europe. 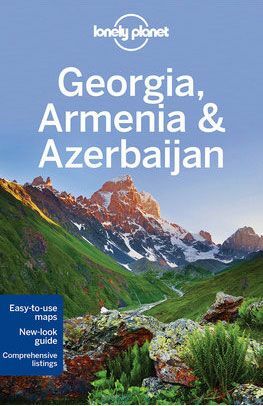 The nature varies from snow-topped mountain ranges to plateaus, lowlands, dry deserts and to shores of the Caspian Sea. The capital Baku is an interesting mix of cultures, traditions and remnants of different eras, combined with results of new construction boom. 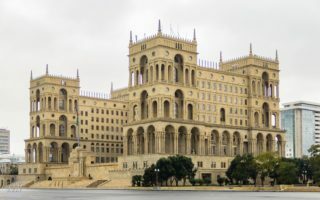 In this post we try to describe the feel of Baku, and introduce some of the must see sights of the city, as well as provide tips for your trip. Baku is the center of the oil industry of Azerbaijan, that has brought wealth to the country for decades. If not that much elsewhere in the country, in Baku the money really shows. Whereas the fleet of cars outside the capital is mostly old Ladas, in Baku the well-offs drive shiny SUVs and sports cars, and once a year the Baku GP brings the F1 circus to the streets of downtown. Past few decades have brought jaw-dropping skyscraper projects and face-lifts to central areas. All this is dashing, but at the same time, a bit too glaring and artificial, at least to our eyes. Even the gorgeous, historic old town has been reconstructed to the point that made us to long for more authenticity. The walled, UNESCO-listed Old Town (Icheri Sheher) of Baku is the historical heart of the city and very popular among tourists. The main sights include the mystical Maiden’s Tower and Medieval Market Square, several old mosques, gardens and the Palace of the Shirvanshash. There are a few old Caravanserai buildings, that have been turned into restaurants and carpet shops. The high city walls with huge gates are a sight themselves, as are the renovated houses along the narrow alleys of the old town. There are also old hamam buildings, some of them still operating. Wandering around and getting lost in the labyrinth of alleys is part of the experience, so ditch the maps for a moment and just enjoy the atmosphere. During the high season (from spring to autumn) that might be challenging though, since even in November, when we saw only a handful of other tourists, there were quite some touts offering tours or other services and advertising restaurants. Old Baku is an essential part of any visit to the city, and many people say that it’s Baku at its best. We really enjoyed it also, but couldn’t help thinking, that all the renewing has wiped away the natural aging and character of these historical neighborhoods. Baku is quite an architectural treasure, some would even say jumble. Around the medieval Old City and next to the glass-and-steel high-risers on the coast, Baku downtown is full of huge stone mansions. Most of the structures in the city center were build in early 20th century, and have clear European style features. Baku is at times referred as the Paris of the East, as especially when illuminated, the stone mansions do resemble their counterparts in Central European capitals. 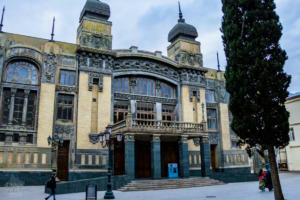 A popular strolling and sightseeing route to the city center goes from the southern side of the Old City through the Philharmonic Fountain Park, circulating outside the city walls past Baku City Hall to the Nizami Museum of Azerbaijan Literature with its gorgeous facade. From there you can continue to the Fountain Square and through it to the other pedestrian areas of the city center. The main shopping streets are lined with brand stores and restaurants and, together with the squares, are popular places to hang out. The several kilometers long Bulvar, Baku’s pedestrian promenade by the Caspian Sea coast, is one of the prides of the city, and home to some of the main sights. With leafy parks, fountains and cafes, the wide promenade makes a nice venue for get-togethers and afternoon walks. From along the promenade you can admire some of the architectural gems of the city. In the southernmost end of the Bulvar is the Flag Square with a 162 meters high flag pole, and a gigantic flag of Azerbaijan. Next to it is the futuristic Chrystal Hall, venue for the Baku Eurovision Song Contest (held in 2012) and other concert and sports events. Towards the center, you’ll walk past Baku Eye Ferris wheel and the soon-to-be-opened splashy Caspian Waterfront Mall. Azerbaijan Carpet Museum is pretty easy to recognize, as the building is shaped like a gigantic, rolled carpet. Next to it, there is Baku’s “mini-Venice”, kind of a tiny (and a bit weird) theme park, where it’s possible to hire gondolas for a ride along narrow waterways and under small pedestrian bridges. From here onward, the Bulvar is more like a series of leafy parks, and continues past the Puppet Theater, the Museum Center and the Park Bulvar Mall, coming to an end in Marine Passenger Terminal. Don’t miss out the view towards the massive, Stalinist style House of Government building near the northern end of the Bulvar. The trio of blue-glass Flame Towers can be seen almost everywhere in Baku, but it’s worth climbing the steps (or taking a ride either by a funicular or a bus if you prefer) to the ridge where they stand. These iconic skyscrapers were completed in 2012, and are light up with a light show by over 10 000 LEDs in the evenings. From ridge, right above the Old Town, you can not just see the towers better, but have a great view over the whole city and the Baku Bay. Inside the towers, there aren’t any viewing platforms or such public places to go. Towers are mainly for apartment and office purposes, and one holds Baku Fairmont Hotel, Le Bistro Restaurant and Park Cinema. There is also a Lamborghini show room, opened in 2014. We didn’t even try to go inside, so can’t provide any further info of the possibilities to pay a visit. Just next to the Flame Towers, is a park and memorial area with cemeteries, monuments and a mosque. The Martyr’s Lane is a a memorial and cemetery complex dedicated to the victims of struggles with the Soviet army for independence, as well as to those killed in Nagorno-Karabakh War between Azerbaijan and Armenia. There is also a memorial to Turkish troops killed in the Battle of Baku in 1918. The Eternal Flame itself is in a massive stone structure, and burns with huge, hot flame on top of a star-shaped tomb. From the memorial, you can walk to the viewing platforms on the lover level of the Upland Park, and admire the views over the city. Flame Towers may be the best known skyscrapers in Baku, but not the only ones. During past couple of decades, a series of glass buildings has replaced some of the old apartment buildings near the coastline. Especially the Crescent Bay area, next to Baku port has turned into a pretty futuristic neighborhood with skyscrapers and luxury boutiques. The construction of the next masterpieces, the Crescent Moon Building and the so called Death Star Hotel that will resemble the sun, is still ongoing, but when complete, these two will be definite eye-catchers. With all the new projects, including artificial islands, Baku skyline will start to more and more resemble the one of cities like Abu Dhabi and Dubai. The next era of city development is the Baku White City, a huge development project that will turn old oil industry zone to a modern urban area. More about this interesting project will follow in a separate post soon. 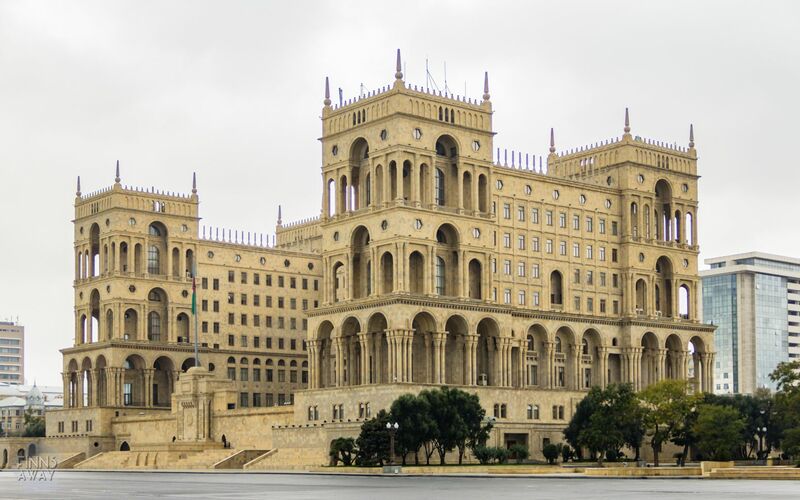 Even though Baku is living an era of face-lifting, reconstructing and modernizing, the Soviet past of the city is visible in the architecture outside the city center. Bunch of gray concrete buildings are still there, but mostly in the quarters further away. Under the polished surface lies a more real Baku, so to say. We took a metro ride all the way to Hazi Aslanov in the northeast to explore Baku suburbs. Not much to see or do there really, but it’s always interesting to see the everyday life of “normal” citizens. 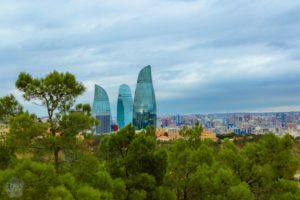 Planning to travel to Baku? Probably the best time to visit the city is from spring to early summer, or in autumn, as the mid-summer months are really hot. If you are okay with chilly and windy weather, winter months could work as well for a city holiday. 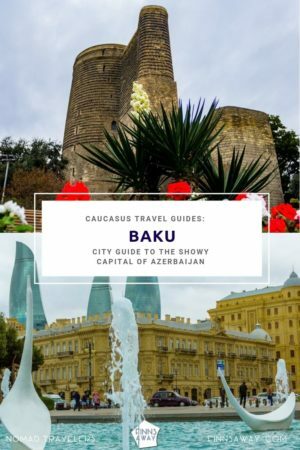 We warmly recommend combining a visit to Baku with traveling elsewhere in Azerbaijan, and if time allows, also in neighboring Georgia and Armenia. Keep in mind though, that Azerbaijan and Armenia are basically still at war with each other, and visiting Nagorno-Karabakh (Artsakh) is considered as a criminal action in Azerbaijan, meaning that if Azerbaijan officials know that you have been in Artsakh, you are banned to enter Azerbaijan. The currency of Azerbaijan is Manat, AZN, and one Euro is roughly 1,9 Manat (Dec 2018). ATMs and exchange offices are easy to find, and also credit cards are widely accepted, especially in Baku. 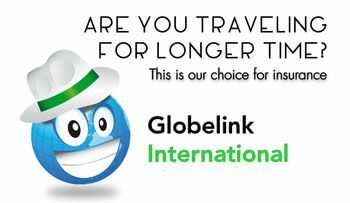 The most common way to enter the country is via Baku International Airport, or from Georgia by train or bus. Baku Metro is an easy way to travel inside the city and from railway station to the city center. There is also a wide network of city buses. Using city transportation is easy with re-chargeable Baku Card (Baki Kart), an electronic payment system. 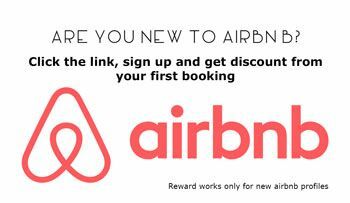 Regarding accommodation, there is a wide range of hotels and nowadays rising amount of hostels to choose from. 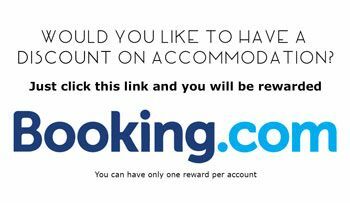 For those looking for affordable options with great location, we can recommend Bed Rooms hostel. This new, comfy place just opposite the Sahil metro station has dormitory and one private double room, and a shared kitchen. We stayed few nights also outside the city center in Yeshim Hostel, a nice guesthouse type of family hotel that can be easily reached using city buses, but is still within walking distance from the Flaming Towers also. Our travel partner airBaltic flies from Riga to Baku in summer season, and to Tbilisi in neighboring Georgia around the year.